Are you looking to rent a party bus? Do you live in the Beverly Hills, MI area? If so, then here at Rockstarz Limousine and Party Bus, we can provide you with everything you need, and more resulting in you having an amazing experience with us from start to finish. When it comes to looking for a party bus in Beverly Hills, we understand that there are certain things that you would need to make sure that you love your time spent with us. In this regard, we have spent time making sure that every aspect is covered whether it be the spacious interior that allows you to entertain more guests than ever before, or the comfortable leather seats that provides some rest when the party is still going on. In addition, our Beverly Hills party bus rental also means that you get to take full advantage of the stunning sound system that has been installed that will really allow you to get the party started. Furthermore, our laser light show will be able to add that extra bit of atmosphere that should make everyone feel as if they are in their own private nightclub cruising around town. A number of individuals have used our Beverly Hills party bus service to host a wide range of parties and celebrations. 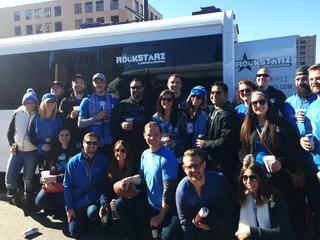 No matter if it is your birthday, an anniversary of some kind, or if you just want to have some fun times with your friends, our bus is going to prove to be the perfect location. So, any individual living in the Beverly Hills area that is indeed seeking a party bus should look no further. Give us a call here at Rockstarz Limousine and Party Bus, or complete the form on our website and a member of our team will get back to you as soon as possible.